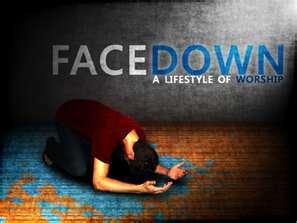 ABRAM FELL FACE DOWN – twice in this passage, Abram is prostrate before God, the only worthy response to God’s presence and the words of His covenant promise. ‘O worship the Lord in the beauty of holiness, bow down and worship, His glory proclaim’. WALK BEFORE ME AND BE BLAMELESS – which of us can ever say we walk blameless before God? Jesus said in our reading yesterday, “Be perfect as Your Heavenly Father is perfect”. This is certainly an ‘aim high’ calling, but surely, too, it has to be possible, if only by God’s grace, His covenant initiative, and His constant and continued presence and work in us. CIRCUMCISION – the sign of the covenant – a sign of surrender, of yielding to God. All within me, today, says, ‘thank God for the new covenant’ !! ABRAM BECOMES ABRAHAM; SARAI BECOMES SARAH – this name change is created by adding a ‘breath’, a ‘h’. I love the sense that we become new people, even have a new name, when the God breathes His promise, His purpose, His life into us. What would your new name be, with an extra ‘h / ha’ slipped in, in the middle or end of your name ? That would make me “Phihil”, or “Philha”….mmmm. SARAH LAUGHS – at the news that she will bear a child. All her years of hoping and longing, to the point that she believed it could never happen. Her “is anything too hard for the Lord?” is echoed in Gabriel’s message to Mary, “nothing is impossible with God”. Good for us to remember today, whatever we’re facing, in whatever way we’re beginning to lose hope. GOD’S PATIENCE – the question and answer session between Abraham and God, re. Sodom, is fascinating, if not laborious! It does speak of God’s patience in the face of our constant questioning. Abraham gets to glimpse ‘what God is about to do’, and appears to get the chance to quiz God on His thinking, His motivations. Each time, Abraham pushes a little more, until God reveals He will not wipe out Sodom if He finds merely ten good and right-living men. Don’t Worry – life itself is far more important and valuable than the food, clothes, material stuff we so often worry about; see the birds and the lilies, God provides for them, how much more will He for you. Heavenly Father knows what we need. Alternatively, our main concern should be God’s kingdom and His right purposes for us – everything else will fall into place. Don’t Judge – the measure we use to judge others will be the measure used against us! Ouch! Watch out, then, and let’s not judge. Jesus is hot on outing hypocrisy, especially from the self-righteous. So often, the most judgemental amongst us cannot see what is glaringly obvious to others (the plank). Attend to correcting self before and above seeking to correct others (the sense is that we will be in a much better place to help our brother / sister (even in the wisdom of passing on the sacred pearls we’ve discovered) if we’ve spent disciplined time examining and correcting self). Do Seek – take maximum time asking, seeking, knocking at God’s door, finding out as much as we can about His purposes, and asking for His will, His way, His gifts. love others, as you would like others to love you…. SQUEEZE THROUGH – it is a narrow gateway onto the narrow path, a high calling, a way that can sometimes feel lonely (though “you’ll never walk alone” (to quote the anthem! )), but it is a choice, a decision we need to keep a daily eye on. Are we choosing the narrow or the broad path? BE FRUITFUL – the echo of God’s command from Genesis, this time the focus clearly being on lives bearing fruit – not only saying but doing God’s will, nurturing a true and honest relationship with God, and living it out. and a growing desire to nurture within ourselves the good (fruit) and root out the bad…. I wonder in which area(s) we need God’s help the most today. PROVERBS – warns of the temptation to be drawn onto the broad path which leads to destruction, going along with others’ plans. Great wisdom in the phrase that all who go after ill-gotten gain, will find that their own lives are “robbed”, those who plan the downfall of others, are unwittingly plotting their own. What choices we find placed before us every day. prayer today, too, for those whose of us whose fathers or mothers have placed heavy burdens, and chokers upon their children, by their harsh or cruel actions or words….please bring Your freedom and healing peace, Lord God. As a final aside….what about the three men Abraham and Sarah entertain. It’s a mysterious passage, with many possibilities. Are these men angels (they certainly carry messages from God), or do they represent the trinity (one God, three persons, as hinted at in Genesis, where God says, “let us make man in our image”, and where you can identify the work of the Lord, the Spirit and the Word). 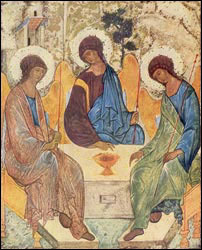 Certainly, in his famous icon of the trinity Andrei Rublev has in mind this appearance to Abraham and Sarah. But then, some of the words are ambiguous (v. 22, the men turned away and went towards Sodom, but Abraham remained standing before the Lord). It’s all very mysterious and I love it !